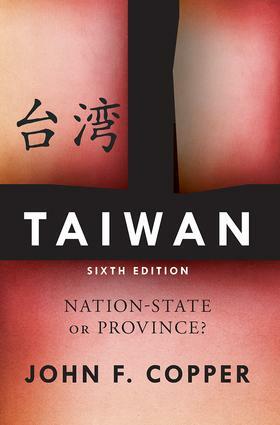 In this newly revised and updated edition of Taiwan: Nation-State or Province?, John F. Copper examines Taiwan's geography and history, society and culture, economy, political system, and foreign and security policies in the context of Taiwan's uncertain political status as either a sovereign nation or a province of the People's Republic of China. Copper argues that Taiwan's very rapid and successful democratization suggests Taiwan should be independent and separate from China, while economic links between Taiwan and China indicate the opposite. New to the sixth edition is enhanced coverage of the issues of immigration; the impact of having the world's lowest birthrate; China's economic and military rise and America's decline; Taiwan's relations with China, the United States, and Japan; and the KMT's (Nationalist Party) return to power. The new edition will also examine the implications of the 2012 presidential election. A selected bibliography guides students in further research.